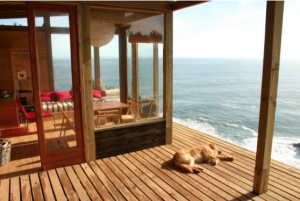 A recent post seen on http://tinyhousetalk.com/cliff-top-small-house/ displayed a 500 square foot home in Chile, that was designed and constructed beautifully by Alvaro Ramirez and Clarissa Elton. This split-level tiny living home, boasts of a deck hovering excitingly over a cliff, offering a breathtaking view of the ocean. And even at a mere 500 square feet, this wood-sided beauty offers an open concept of modern design, with traditional features like the wood burning stove for heating purposes. This eco-friendly work of art is just the type of tiny home design that offers the space required to live stylishly – but affordably. Referenced as costing a mere $15,000 US, this home’s price-tag was less than a new model vehicle …and with full ownership to this space, the owners will not have to worry about rising mortgage costs – ever! Although it might seem shocking, the typical tiny house has a square footage of anywhere between 100-400 sq. ft. – varying in size as much as in form and location. The original idea behind tiny living encouraged individuals to build their own eco-friendly homes. That being said, if construction is not your strong suit – taking on a project such as this might not appeal to you, but can easily be contracted out. Regardless of who builds it, using spray foam insulation to insulate your tiny home, will reduce the cost of heating your home in the winter, and keeping it cool in the summer. As much as tiny living looks like a nostalgic cabin-in-the woods experience, nothing would be more uncomfortable than living in a hotbox during the summer months, or having to layer on every article of clothing you own during a frigid winter. At Coast Foam, we know that insulating a tiny home effectively will ensure your heating and cooling costs are as minimal as your new home. Being a homeowner is an exciting chapter any anyone’s life, but being a tiny living homeowner could quickly offer you a mortgage-free ending to your story!